Also in the name of fairness, my childhood experiences of “white” pizzas, those without tomato sauce,” were terrible so I understand the resistance: dry and flat in flavor. But as an adult I love them especially with vegetables I think taste better when not competing against the acidity of tomato sauce. It helps to take a few a few pages from Jim Lahey here, as I always do when making pizza (and if you haven’t bought his pizza tome yet, you really really should for endless weeknight pizza inspiration) — adding a layer of a quick, easy bechamel sauce under the cheese (I added garlic to it, garlic bechamel > non-garlic bechamel, almost always), using a mix of mozzarella and provolone and then taking a few tips from my beloved broccoli rubble and adding a little lemon juice, zest, pecorino and chile flakes to keep it from flatness. The result is an ideal weeknight excuse for pizza for dinner, very green, not too heavy but not abstemious either, and if you’re lucky, with the best leftovers there could be. I resisted — for once — finishing it with an egg on top or baking in onto the pizza but I will not next time and you shouldn’t either. * “One time” = Basically every day from 6:30 a.m. until the last call for water at 8:15 p.m. It’s a good thing they’re cute. A bunch of notes and tips: I’ve been using less pizza dough these days and spreading it thinner with oiled fingertips and have been happier with the thin, crisp results. (Directions below.) You can cook the broccoli any which way but I do find this simmer/steam to be fastest. Finally, I think this pizza would take well to crumbled sausage or chopped pepperoni or another salami, should you not need or wish to keep it vegetarian. Assemble pizza: Brush either 1 13×18-inch rimmed half-sheet pan or 2 9×13-inch quarter-sheet pans (as I do) with olive oil. Divide your dough as needed (I made 3 oblong pizzas in my 13×18-inch) and use oiled fingertips to pull, stretch, nudge and press the dough across the bottom of the pan. 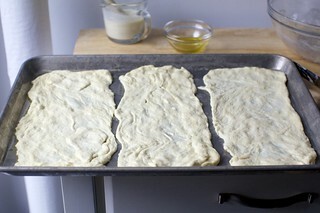 The dough will be thin and imperfect; just try to get it even and if holes form, just pinch them together. No matter how bad it looks (you can see mine, for example), it’s going to bake up just fine, thin and crisp. Bake for 13 to 16 minutes, until the pizzas are brown at the edges. For better browning on top, you can run the finished pizzas under the broiler for 1 minute. Cut into wedges, squares or strips and dig in. 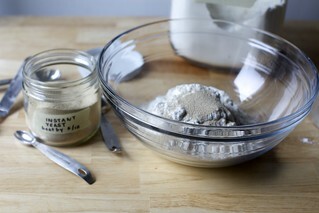 In a medium bowl, stir together the flour, yeast and salt. Add the water and, using a wooden spoon or your hand, mix until well blended, about 30 seconds. 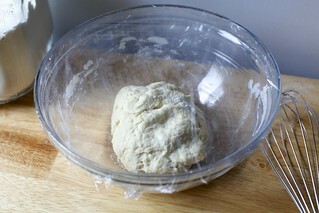 Cover the bowl and let sit at room temperature until the dough has more than doubled in volume, about 2 hours. Continue using instructions above. LOVE this sub for white sauce!! If you can get it, Mexican crema is even better than sour cream. It’s basically crème fraîche. And I’ve been doing what you do too….it’s so good! I have in a pinch crumbled some Boursin garlic and herb cheese over the base in lieu of a white sauce – and I have to say it is rather delicious. I’ve used soft goat cheese and roasted garlic as a base for pizza. Like the “white” pizzas better than red ones! I have missed this since moving from Cambridge, MA 26 years ago. Can’t wait to make it. I’m not a fan of broccoli, but I find the idea of broccoli rabe pizza intriguing. Now I’m thinking about a pizza riff on Philly pork sandwiches with sauteed broccoli rabe and roast pork. Broccoli rabe is amazing on pizza! Make sure to blanch it first, of course. One of my favorite local pizza places has broccoli for a topping option. I’m the only one I know who goes for it, but I love it! My 4-year old daughter LOVES broccoli pizza. I’m not really sure how we discovered it, I think she randomly asked for it when we asked her what she wanted on her pizza. I like to say “yes” when she asks for healthy options (even though I thought it was blasphemous). Turns out it is really yummy! I like the roasted flavor of the broccoli. I will try this recipe for sure at home! I actually love broccoli on a pizza, but mix it with roasted cauliflower and carrots, along with green onion and very light cheese. And I use barbeque as my base. Delicious! Hmm. You roast the carrots and cauliflower or just the cruciferous? I think some people are just silly. While I am not into vegetarian food, I think this would be delicious and maybe even better with some scamorza cheese. Broccoli is my favorite vegetable! I make pizza 2-3 times a month and put broccoli on it often. I like to chop it up finely and sauté it with garlic and salt until it’s kind of crispy, then scatter it over the top with other veggies. I am so excited about this. You seem to share my affinity for meals that are carb+cheese+green vegetable with the obvious additions of garlic, lemon and red pepper flakes. Who would think you ruined pizza with broccoli? I always put broccoli, artichoke hearts, and sliced tomatoes on my pizza. My favorite. I can’t wait to try this. Looks absolutely phenomenal. When I saw the recipe title I actually thought “oooh, broccoli pizza sounds amazing!” Possibly because I am also in love with your shaved asparagus pizza. And my favorite pizza place makes a primavera pizza with roasted broccoli on it. Green vegetables will never ruin pizza for me! I have to agree with many of your commenters that this sounds yummy…I mean, broccoli and cheese are a classic. I don’t think you could go wrong. Of course, for carnivores, like my husband, adding meat is always a must. I would be happy either way. Thanks for the great recipe! A local pizza place here does a similar pizza with bacon and it’s delish! I’m making this tonight with bacon, to help appease the carnivores of my family. As Dianaw I prefer using whole fat high quality sour cream for white pizza. It adds salty sourness that is hard to replicate with a bechamel sauce. I think the broccoli pizza concept is great and will for sure introduce it to my broccoli loving kids! The very best and most memorable pizza I have ever eaten was a broccoli and ricotta and garlic pizza at a stripmall pizzeria in New Jersey. So my reaction to seeing this was the exact opposite of that which you imagined at the top! Hi any chance you remember the name of that place? I am from NJ and would love to try it. I am just against the whole white pizza thing. It is huge in France, where pizza trucks and pizzerias are every few meters. I might try putting broccoli on pizza, but on HALF, with flesh on the other half for my husband, AKA the Carnivore. Otherwise, Marital Discord. Which is on par with, if not worse than, young’uns howling. I see no conflict between broccoli and tomato sauce. They play very nicely together. And the egg on top? If you are in France, expect it. Will give your pizza dough a try, to change things up. Not that I color inside the lines or follow recipes all that well…. Yum. My favorite italian restaurant growing up had a ‘fried rigoletti with broccoli’ dinner. Just a big heap of fried-until-crispy pasta with butter/olive oil and garlic with broccoli and topped with gooey and browned mozzarella. Oh, and a side of marinara to dunk it in. This sounds like the pizza version of that. @Jasmine, that sounds delicious! I wasn’t able to find a recipe online. I wonder if you or any other commenter might have one. I’ve never tried to fry pasta. Like CarolJ, I would love this recipe! It’s so intriguing. This looks great! How much yeast would you use if you were going to 4x the crust recipe? as soon as i saw, “congrats, smitten kitchen, you’ve ruined pizza!” immediately thought of “inside out.” ahh, such a good reference. anyways, i’m the person who puts all the veggies and cheese and no meat on my pizza at blaze/mod/pieology/etc, so broccoli/broccoli rabe on pizza sounds delicious. When I made pizza dough before, it rose fine on the first prove but didn’t rise very much the second time. I thought it might not be kneaded enough but am also aware you can over knead? People rarely overknead by hand but machines can. There isn’t really a second rise here; it puffs a bit while you’re putting toppings on but it basically finishes in the oven. Is this the dough you were using? I’ve used your (Not Really) Jim Lahey’s Basic Pizza Dough recipe several times, LOVE the way it tastes but it always seems to dry when I mix it and I inevitably end up adding more water…any thoughts? Do you use exactly 2/3c water? Mine never really rises and I’m wondering if the extra water is my problem? Water shouldn’t keep it from rising; it’s possible it need more time. What kind of yeast do you use? The dough is a bit stiff at first and should be very soft once proofed. I find pizza dough to be a balancing act. You either make it really soft and then you don’t really have to knead it, just give it a stir or two, but then it’s quite mushy when it’s proofed and scares people newer to doughs. Or, you make it stiffer and it needs hand-kneading on a counter or a dough hook to bring it together, but it’s easily picked up and pressed into a pan once proofed. What I’ve been liking about this one is that it’s in the middle: a little stiff/awkward to stir but not so much that you have to knead it on a counter. Sticky to press out but not impossible to work with. 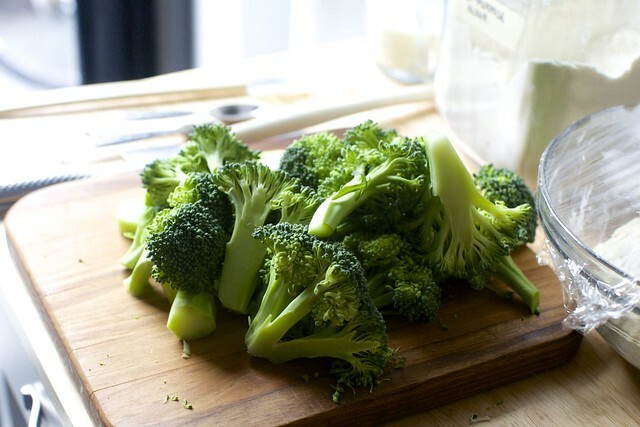 I love to chop broccoli small and roast it with olive oil, garlic and pepper flakes. Then when it is golden, I add some lemon zest and juice. The result tastes amazing, both on and off of a pizza. Am I missing the link for the kiddo pic or is it not actually there? I went and manually found it on Flicker. Back in the late 1970s I worked at a pizzeria in Cambridge — Bel Canto — that boasted a very tasty whole wheat pizza with broccoli and walnuts, called ‘In Peppo’s Honor.’ Great stuff. I was just thinking about that pizza from Bel Canto too. Broccoli and walnuts are a terrific combination. What kind of sauce did this have. White, red or a combination of both? The 50% at my house who would have disapproved of broccoli rabe (and broccoli, too, now that I think about it) have moved out (and now eat both), so us empty nesters will be having this as you originally designed it. Yum–thanks for the inspiration! Oh no! I just threw the last of my broccoli into the pot to make your broccoli cheddar soup! YES I have been a big supporter of broccoli pizza every since my summer spent at my favorite pizza restaurant in Lawrence, KS, in 2006. It is surprising, sure, but the flavour is so good on pizza, white sauce or red sauce, in my opinion. I used to put it on slices with mushrooms and pepperoni. You’re a genius. BROCCOLI you are perfect, marry me. That sounds amazing! I remember, a few months a go, having a hankering for broccoli on pizza, like a serious hankering for it. I finally went to the one pizza place in town that has it as a menu option, and I enjoyed my broccoli, pineapple, and bacon slice thoroughly, but your combination also sounds like something I need to try next time I can convince someone to eat there with me! My favourite way of putting green veggies on my pizza is to puree them (raw or lightly cooked) with a big dollop of pesto then heavily slathering that on the dough as my sauce under the cheese. Bit this does look yummy too! Yum, try a pinch of nutmeg in the white sauce. Next time I’ll try broccoli for sure! Just don’t forget to oil the bowl like I did! 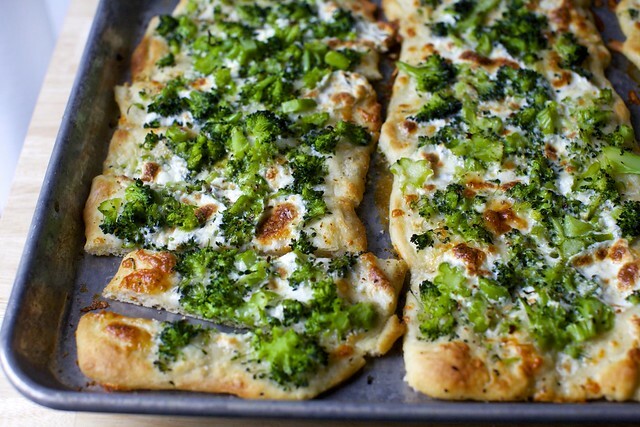 I love white pizza with broccoli! It’s especially good reheated for breakfast with a fried egg. I will make this! Your pizza dough is my favorite – a total game-changer for me. I have a recipe that I like for a quick lunch that is quite similar. 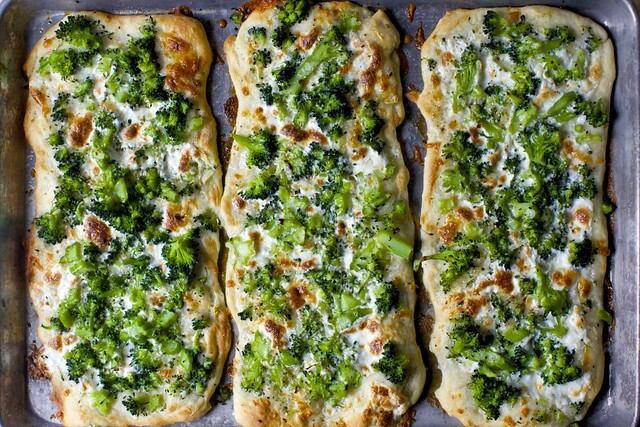 They are broccoli melts – just some sauteed broccoli and garlic mounded on bread and broiled with cheese on top. Delicious and definitely more than the sum of its parts – which is what I’m sure this pizza will be. Nope. Probably tome – it’s another word for book (usually a thick one)! I was just thinking the other day about how I needed to think of some ways to make broccoli rubble a legitimate dinner, if only because my husband and son want dinner to be more than just broccoli with a fried egg. (Eye roll emoji) so thank you for hearing my request and turning into something neither can say no to. And when I saw the picture on instagram, Inside Out immediately sprang to my mind so I was delighted to see you reference it here. This looks so easy and yummy! Definitely putting on next weeks menu plan! Adding some cooked shredded chicken on there would make it a little more filling. I’ve made something similar and it’s delicious. A local pizza place has it on their menu. Also, you gave the dough instructions twice. Looks similar to the Williams-Sonoma one I love. As a side note, I made your icebox cake tonight for my mom’s birthday tomorrow. Added a little dissolved espresso powder in the cream. :). Thanks! We have a very small (2 outlets) pizza chain in my little town and the next one over, which specializes in oddball stuff, to the point that the staff wear T-shirts questioning “…on a pizza??? ?” They have Mexican pizzas, vegetarian pizzas, dessert pizzas, more-or-less-normal pizzas, and a few really off-the-wall ones like fried chicken, mashed potatoes and gravy (which is actually rather good if you try not to remember it’s a pizza). My favorite, though, is the Jack Sprat – tomato sauce, cheese, broccoli, green and black olives, mushrooms, bell peppers, diced tomatoes, — and cashews. The same people who put pineapple on pizza! This is not really pizza, it is broccoli on flat bread. And I believe you when you say it was tasty. But it’s still not pizza. OMG!!! this is awesome. This pictures are watering my mouth. I guess this would be the perfect Dish for the Valentines day. Thank you so much for share this. Dough instructions at the very end have a duplicate paragraph. I loved broccoli pizza growing up. Always so crisp and garlicky! 2 things- late in the post you said broccoli rubble instead of rabe, which made me smile- because that is cute. AND there is no link to one of your cutie pie kiddos! :( I thought you usually did that, so did you forget or just didn’t today. I love broccoli on pizza!!! Actually I meant to link to this, where I do call it broccoli rubble. And I also forgot to put the kid pic link in; now added. Laughed about the comment about 50% of the opinions of your family being the loudest… In our family of four we got to vote. We got the same number of votes as our age. Love your writing please keep it up, and good luck with your growing TV presence. Well, I for one think it looks and sounds fantastic! We had our pizza night last night and we just added boring baby spinach and anchovies. (We don’t like a real heavy pizza) I am going to go the rabe next week. Do you have any pizza left?? I think it looks GREAT……..cannot get Broccoli Rabe here :( makes me crazy. This looks delicious. I’m not a big pizza eater but since I love broccoli this will get a try. P.S. I think there’s a typo in the asterisk note at the end. Would frozen broccoli (defrosted) work with this? I forgot to put the link in! Now added. A lot of people put broccoli on pizza. Bertucci’s has been doing it for years with the Silano pizza. Broccoli, chicken, and a lemon-pepper cream sauce. Seriously this looks like perfect pizza to me! I’ve been subbing broccoli for zucchini in that August recipe you posted for Zucchini-gruyere pizza – that might not be the correct title in your post. But I like broccoli better than zucchini in/on that. This looks so good! Also today is National Pizza Day! This is my favorite pizza! There used to be this country pizza shop down the road from my parents and they sold this (with sausage). Thank you for the recipe – I’ve never had a starting point for how to make this before now. Love your book & site. Your recipes are fabulous. I use them all the time. My request: The info you posted two weeks ago on the video on how to make valentine checkerboard cookies was amazing. Unfortunately I deleted it by mistake. I would really appreciate it if you could send me the link. I just made it! I might have over baked it a bit even at 13 minutes, as I needed to forcefully use scissors to divvy it up. Just delicious. I subbed my basil pesto for the “base” and topped with only mozzarella. I did wonder if I could halve the dough, even though you had already done so! (mine would be a quarter recipe of Lahey’s). Made this tonight and it came out spectacular! I did use the cheeses I had–substituted 1/2 cup pecorino with 1/4 cup shredded parmesan, and the provolone with pepper jack. I also, on a hunch, added 1/2 tsp chat masala to the broccoli, and it really enhanced the tangy flavor, which surprisingly (to me!) is a really good flavor for broccoli to have! in fact the broccoli was so yummy that that I could have eaten it up as a salad all on its own! Also wanted to say Deb, that I LOVE your idea of pulling the dough really thin to get a thin crust pizza. My previous result with the billowy, pillowy pizza were sad enough for me to never attempt it after the first time. But this–this I’m gonna try again! Your recipe name is under attack the same way the pork ragu was. Come on, people, lighten up! Mad respect to Italian grandmothers and all, but this is a food blog for goodness sake, a yummy space where we can color outside the lines! I have loved broccoli on pizza since forever! Can’t eat broccoli rabe or my tummy hurts, but broccoli works just was well IMO. I like to saute it with some olive oil and garlic to get some crispy bits throughout. Will have to try your sauce recipe. I tend to just like EVOO, salt, broccoli, and cheese. Haha! Your household sounds a lot like ours! We try to use broccoli in creative ways as well, as it’s the favourite vegetable consumed by our little ones. In the end, they’d rather just have it steamed over any of our creative interpretations. Compromises will have to be made to keep everyone h̶a̶p̶p̶y̶ sane. i’ll be honest, i won’t be putting broccoli on pizza any time soon…or ever. or eating it at all. but i’m able to look past it for a delicious sounding white pizza. why does every place ever put things i don’t care for on white pizza? the whole point of white pizza used to be that there wasn’t anything on it. now the few places that carry it do so with broccoli, spinach, tomatoes…etc. and it’s not worth the risk to request it without in case they don’t listen and it shows up inedible. Given your obvious and historic love of broccoli, I hope you’ve tried the Broccoli Classic at No. 7 Sub. It does not disappoint. Made it tonight – it was awesome! Used red bell pepper instead of broccoli and loved it. My husband and I started eating broccoli (and sausage!) pizza after a Smitten casserole that we loved from years ago. We get it with red sauce, but it’s one of our favorites and force everyone we dine with to try it and it hasn’t failed since. I think it’s the most underrated pizza topping! This actually looks so good, I love broccoli! Made this tonight and loved it but would definitely go lighter on the sauce next time. The middle of my pizza turned out a bit soggy! Thanks for making my life a little bit more fun and a lot more delicious; I look forward to your posts each week! Honestly, I never knew broccoli pizza as taught here can be so good looking and nutritious. Baking it till it is golden brown looks great. I made this last night and thought it was perfect. I was short on time so used the quick pizza dough from Deb’s cookbook. I only had a small amount of mozerella so I also crumbled some goat cheese on top and it was a great addition. (I mean when has goat cheese not make a valuable addition?) I will definitely be making this over and over again. My first attempt at making pizza and it was a huge sucess (as in I have made pizza 3 times in the last 4 days) I used to be so intimated at the thought of making my own dough, needless to say this dough is yummy and super simple to make. I had all ingredients on hand when I first read article….basically why I even bothered to make it! I’m soooo happy I did, and my family is too. This was amazing, Deb! The flavor is outstanding; the lemon really made it pop. I made mostly as written, other than using all mozzarella and no provolone. Also, out of laziness I made one big pizza instead of three small ones, which caused me to have not quite enough sauce, so I just spread it reaaaaallly thin. If I make one big pizza again I will double the sauce. The ingredients are already in my fridge! 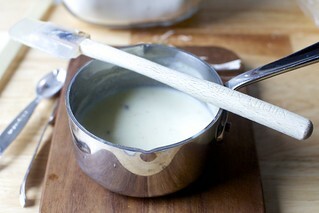 An easy substitution for the bechamel sauce is to use lebanese garlic sauce (the kind used in a falafel or shawarma). Where I live in Canada, this garlic sauce is available in many delis. Using naans instead of pizza dough is very popular in our household. Made this for dinner last night and it was absolutely perfect. Made it almost as is except I didn’t have provolone so I did mozzarella above the bechamel but below the broccoli and a mix of pecorino and Parmesan on top. Had to add a touch extra milk because I let my bechamel sit too long but other than that it was delicious! Going into our rotation of go to recipes! I’ve always made dough in the bread machine, but honestly, this was even easier, and tasted better. I used King Arthur Bread flour and fresh yeast, and did the 22 hour rise. My only problem was that after 22 hours, I struggled to get the dough stretched to the full size – I managed to cover about 2/3 of the 9×13 pan. Based on other comments and responses, this suggests it had not risen quite enough. Could have been because it’s winter in Maine. I only thought to put the bowl in the (off) oven with the light on for the last few hours, so I think next time I will try doing the full rise there. Is there any reason I can’t do that? Do you have any guidelines for adjusting the rise times for winter in a 67-68 degree kitchen? In case it’s not obvious, I meant to post this comment and question under the original Lazy Pizza Dough recipe. I also neglected to say that despite its diminutive size, the pizza did come out delicious! I make dough in a no-central-heating house which ends up cold, like yours in our winter. What works for me: pre-heat oven to 150-200° then turn it off. Cozy for raising yeast dough. ♡ Just be sure not to forget to Turn It Off. Made this last night and it was incredibly delicious. Only problem I had was there wasn’t nearly enough sauce to cover the pizzas – which was fine because it’s rich, but just wondering where I went wrong with it. It was VERY thick, not liquidy, which I think contributed to it not spreading as much. Not sure if I messed it up somehow but no matter. It was delicious and I will definitely be making it again. This was awesome! I made 2 other detailed pizzas so it was a lot of effort overall for pizza, but worth it. I did manage to double salt the broc, so that was a bit of a bummer. Still, it’s a fun pizza and I would probably make it again. Thanks for always sharing such great recipes! I often make lasagna with broccoli in white sauce, almost the same as the above recipe, topped with cheddar and mozzarella. Looks fantastic and tastes even better. Very easy to make but very effective for guests. I bake it in a huge round earthen pan. Back in the 80s, when I was a little girl, there was a pizza shop in the mall. One of the ingredients on their veggie classic was broccoli, and it totally stepped up the pizza to wondrous extremes! I guess it depends on how you feel about broc. I happen to love it. Thanks for the recipe! I made this and it was wonderbar. My own version combined the beschamel with a white sauce base for Flammekueche: http://www.saveur.com/article/Recipes/Alsatian-Bacon-Onion-Tart (and the modification i did with THAT was by browning the onions first and crisping the bacon and mixing both into the white sauce). I used parmesan instead of percorino. And topped with the broccoli a few black olives. the lemon overtone was perfect and the fresh mozzarella, well, it did the job it was born to do. I have learned that to get a crisp-ish crust for pizza, I parbake the dough on a pizza stone, pull it out and top and then pop back in at near broil temp. This is definitely my new favourite thing. I made this almost exactly as written (except forgot to buy mozzarella, oops). Everyone loved it – even the teenager who truly felt I had ruined pizza by replacing pepperoni with broccoli. The garlic bechamel was a great touch. I effing LOVE broccoli and so appreciative that you use it as often as you do. Really fantastic. Made this in heart-shaped form for Valentine’s Day using 2 bags of premade dough from TJ’s and made 5 individual pizzas. My kids (7, 5, & 2) declared this better than plain cheese pizza. Finally a pizza we can agree on! (Left the crushed red pepper out and used as a topping for adults). I love white broccoli pizza. My favorite way is with seasoned ricotta cheese underneath the mozzarella melty layer. Made it last night using soft goat cheese instead of bechamel sauce. Just added the garlic, mixed directly in the plastic container the cheese came in and spread it on the dough, couldn’t be easier. I also added some thinly sliced shallots because I love onion on pizza. Didn’t have provolone so I just increased the amount of pecorino. Very quick and delicious, love the crispy yeasty dough and the lemony broccoli topping, thought it worked really well with goat cheese. Just wondering …do you usually use sheet pans for your pizza without the fuss of a peel and stone…looks great in the photo… seems so much easier… thanks. I do because I have broken so many pizza stones, I’ve given up. I know a lot of people swear by the baking steel and I’d totally buy one next but I also have a cast-iron pizza pan and so don’t want anything else. And I still just use baking sheets. It doesn’t make perfect crusts but it is easy. I made this last night and it was FANTASTIC! I included the poached eggs and it was a hit. At first the family was not thrilled about broccoli pizza with poached eggs, but they’ve definitely come around. I can’t wait to make it again. Thanks, Deb! I made this tonight and it was delicious! The lemon really made it special. I did cheat and use storebought dough, but it still turned out great. Eh, broccoli always seems to get this kind of knee-jerk reaction from people. I used to hate it too. Largely because there was a period of a year or so when it seemed that it was the only side-veg that my mother would make. Once she was over that phase and we had more variety, I eventually grew to enjoy it again. I suggest trying this pizza with pesto rather than white or red sauce as a variation. My favorite I’m-too-lazy-too-make-anything frozen pizza is Amy’s broccoli pesto pizza with sliced tomatoes. Yeah, the crust is aytpical (though I find it acceptable for frozen, suspect I’m in the minority), but the topping combo is excellent. Can’t imagine how much better it would be with a quality pizza crust – homemade and fresh, dressed up with lemon, parm, red pepper flakes, etc. I have lazy dough waiting at home for me. I am so excited that this is going to happen today. I have to admit, I was skeptical about every part of this recipe turning out, but your photos looked so good. And you have yet to fail me, I should have trusted you. It was DELICIOUS! I am amazed I was able to get such a crisp crust in my home oven! Best ever! All of your recipes are wonderful and creative, but this one has infinite possibilities. Thanks for introducing me to a fabulous thin crust. But first, everyone… Make it exactly as written… the lemon, the garlic, just this right cheese- perfect! Use a scale to measure the ingredients for the crust. No brainer! I made the three small pizzas, just like the photo. FABULOUS! Can’t wait to experiment with different toppings. Thank you! We made this tonight. It was AWESOME! Legit my new favorite pizza (and that of my almost five year old too). Loved it so much we’re having it for two Friday pizza nights in a row. Never sorry. Loved it on a WEDNESDAY night before church choir practice! Good grief, this is *exceptional*. I was nervous about bechamel on pizza – generally we favor very crisp, lightly-topped, truly Italian-style pizzas – but this shot right into my top three homemade pizzas of all time. The only change I made was to stir a handful of blue cheese into the bechamel, and therefore to forgo the provolone. Now that I see broccoli on pizza I wonder why I have never seen it before! Looks great. Thanks, as always, for another great recipe. YUM!! This was delicious. I used some very fresh Welsh cheese (caerphilly) instead of the mozzarella & it was SO GOOD. My partner is getting on to me for talking about how good it was for too long! this was EXCELLENT. my dough didn’t rise much (instant yeast, bread flour) but it didn’t matter. Delicious!! A bit too veggie-tastic for the meat lovers in the family, but I loved it. Next time I’ll try the crumbled sausage idea, making some with vegetables only and some a mix. Thank you! I am simply against the entire white pizza thing. It is gigantic in France, where pizza trucks and pizzerias are each few meters. I may have a go at putting broccoli on pizza, however on HALF, with substance on the other half for my significant other, AKA the Carnivore. Something else, Marital Discord. Which is comparable to, if not more awful than, young’uns yelling.I see no dispute among broccoli and tomato sauce. They play wonderfully together. Besides, egg on top? In case you are in France, expect it. I Will attempt your pizza hitter out, to switch things up. Not that I shading inside the lines or take after recipes all that well.. Amazing!! Everyone loved it. The lemon zest and juice with the broccoli was incredible. I skipped the provolone and just used mozzarella, and used parmesan instead of pecorino. I also added some sweet italian sausage over top. Made this tonight along with your shaved asparagus pizza and both were absolutely delicious. I made the white sauce here and put (leftover) roasted beetroot , spinach and goat’s cheese on top. Love all the tips and ideas. I made this tonight, and I think it’s my first bechamel! I was so proud! My local market sells a pizza dough that’s handmade daily that we rely on for easy pizza nights. After reading the comments, I made the bechamel for the base, but mixed in about 2 T. of full-fat sour cream for extra tang. I used the cheeses I had on hand (a mix of mozzarella and provolone with shaved parm on top). While we do homemade pizza night often, your recipe encouraged me to try a new sauce and a new topping, and it was fantastic! Thank you! Deb, I’ve been meaning to make this pizza for the month or so it’s been on your blog. I quickly veganized the recipe with oatmilk-bechamel and some herb marinated soft tofu, though. Drizzled some good olive oil over it and devoured a half-sheet full of the stuff before it could even cool down. This was yummy, though my broccoli browned more than yours did, I think I hit the lemon a little too hard but will gladly try again to perfect it! I made this version of the dough recipe but wanted something a bit less fluffy, less pizza-y, if you will (paired with different toppings). I substituted some of the water with 1/4 cup olive oil, assuming that would make the crust a bit denser. The water I used came to about 1/2 cup plus 1 tablespoon in total. I also found more luck mixing with my hand and so I kneaded the dough in the bowl for about 2 minutes. I mixed a Tablespoon or so of kale pesto I had sitting around in with the white sauce (omitting garlic since the pesto was heavy with garlic) and it complimented the broccoli really nicely. Used my standard natural leaven pizza dough (from Tartine Bread) and baked it out on my stone. The sour flavor of the dough added a nice dimension as well. Threw on some poached chicken thigh for protein and was a great weeknight meal. This pizza was delicious! I ended up making a calzone (there was a bit of a dough mishap) and I also added some chopped spinach and ground beef. Holy smokes, was this a hit with my honey. I love roasted brocc, so this caught my eye and led me to your older post about the Jim Lahey dough. Total game changer. Dough was impossibly low-maintenance, flexible (12-hour dough was really more like 10, plus survived three days in the fridge), and baked up just so crisp-aayy. Anyway, just wanted to thank you for resolving a long-standing source of mild dissatisfaction in my life. You’re the best! I absolutely love this idea and all of those gorgeous photos!!! AMAZING. Made this last night! Next time I would make double the sauce, as it thickened up substantially when it cooled. Everything else was spot on for me!! The lemon and chili flakes really made the dish for me. Thank you!!! This was so good! The sauce was really garlicky and delicious, and the lemon and red pepper flakes made the broccoli pop. We’ve made it 3 times since I first found this recipe. Sorry I missed this recipe when originally published! Perfect crust- even made on a cookie sheet. I added garlic and pesto to white sauce and some sweet red peppers to brocolli for color. Delicious. I made this tonight. Wow, was it good! I didn’t feel like making the sauce, so I just used some fresh ricotta instead. The dough is fab—incredibly easy. I threw in a fistful of rye flour for added flavor. Thank you, Deb, for sharing this delicious recipe for quick, easy, homemade goodness. Made this for the second time – so good! I added some mushrooms, diced small and sauteed in olive oil until browned, mixed in with the chopped broccoli. What I really wanted to say, though, is that making them as small oblong pizzas was a total game changer for me. The combination of my oven and my sheet pans means that the bottom of the crust doesn’t brown very well so I always have to take the pizzas off the pan and put them directly on the rack at the end of the bake, and without a peel it was really unwieldy trying to maneuver a big rectangular pizza off a half-sheet pan onto the rack, and then getting it out again and up onto the cutting board. Making 3 little pizzas means I can just use a big spatula, and it’s so much easier to pull them out of the oven. I’m never making them any other way. Made this last night for my friends and it was SO GOOD!!! The broccoli-lemon zest-lemon juice-pecorino topping is so good on its own!! I’m think I’ll be using it as a go-to broccoli salad too!! Maybe this has been asked before (forgive me if it has) but can you leave the initial rise of the dough for longer than two hours? If I were to leave it for 4 would it totally screw up the end product? Thanks! It’s probably fine especially if the place is very cool but much safer to put it in the fridge after 2 hours. In the fridge, covered, it can hold for days. I made this, and I (and my kids) love it. And I oiled my pans well, but I had a terrible time with the crust sticking in a few spots. Was it too thin? Or did I not use enough oil? I’ll try again, I loved the flavor of this crust despite how sticky and slightly unruly it was. It’s much easier and far less messy than flouring my counter and rolling it out! My Husband Ethan is pizzaholic. I was really tensed of his love towards pizza. But yes last friday on his 40th Birthday I made him large broccoli pizza and it was really a lip smacking one. Many thanks for your healthy tasty recipe. I had also tried your Tomato bread and Potato argula roast as my daughter Enna loves them both. Ps: My friend Arlin has tried your shack burger and she asked me to convey you that it was also a success. Love this !!!! second time making it and thank you !!!! It sounded great – we love broccoli, and pizza is a staple, but I was still a bit dubious that this would be delicious enough without the cheese, relying on the base, white sauce, and broccoli. Dubiously, I pushed the base out over a cookie pan, and dubiously covered the base in sauce and broccoli bits. I kept on doubting even as it went into the oven. Oh my god, I can’t stop thinking about the leftover pizza. The base went super crispy, and soaked up the flavours of the white sauce beautifully, and roast broccoli is always a sensation. The chilli provides a welcome bit of heat. This doesn’t really need the addition of sausage, or any other meat, although an egg on top sounds divine. We will definitely putting broccoli pizza into regular rotation. I am planning on making this tonight. Do you think anchovies would work on it? Holy crap was this delicious! The only fail was the Lahey dough. Thankfully I had enough time to put up another batch with my favorite recipe (a Nick Malgieri crust). I made this tonight for dinner and it was really good! My partner who is usually against anything containing any kind of white sauce even liked it! (I was very light on the sauce I must say, I had just under half of it leftover). I will make this again for sure, I’ll try to swap some of the broccoli for artichokes and add olives next time. I tried the pizza dough recipe listed below, somehow it didn’t rise at all so I fell back on my usual 30 minutes pizza dough recipe. I usually mix the yeast in water before mixing with the flour, maybe that was it. Or it wasn’t hot enough to rise? Oh well, I must of done something wrong ! I love broccoli on pizza! 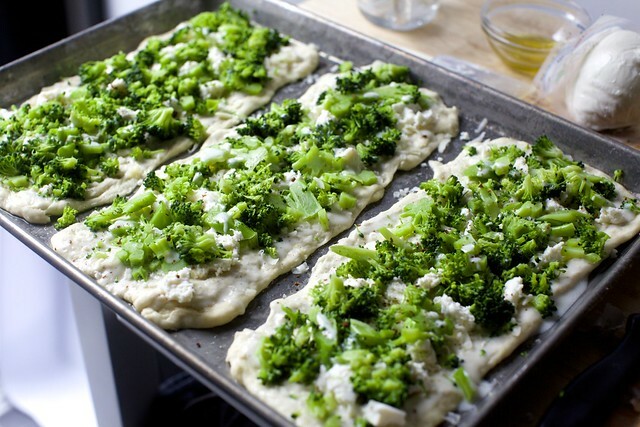 They used to sell broccoli pizza at a Turkish store in my neighborhood, and later when I lived alone, I’d often throw frozen broccoli on top of “empty” frozen pizza, or on top of my own chickpea flour pizza. Q: for the pizza dough, is it One teaspoon and !/4 teaspoon of yeast or just a 1/4 teaspoon of yeast? 1 ¼ teaspoons. 1.25 teaspoons. I think you’re confused because the numbers are all the same size. I made these today as part of a Halloween pizza buffet, which also included your squash toasts in the form of pizza. I was cooking at the home of a friend who had a surplus of frozen prepared pizza crusts, so I used those. The only other change that I made was to add a bit of pecorino romano cheese to the sauce. Everyone loved it! This was delicious! I made it tonight using sautéed broccoli rabe instead of broccoli. I accidentally used twice the amount of provolone but no complaints :). Really loved it and will definitely be making again soon! Thank you! I didn’t realize that what my pizzas had been missing all these years was that garlicky white sauce. I roasted the broccoli along with some red and yellow peppers and some sliced leeks (leftover from your vegetarian cassoulet! ), but otherwise followed the recipe. A keeper! This is a beloved family staple. A few modifications: broil the broccoli with olive oil, salt and pepper for ~ 8 min, then treat as you would the blanched broccoli. I also pan fry sausage ( casings removed). The final product is one cheese-Only pizza, one broccoli and sausage, and one broccoli, sausage and mama lil’s spicy peppers ( Seattle delicacy). Everyone loves this! Thanks, SK!